It’s the most wonderful time of the year! And let’s be honest, it’s also the craziest. To do lists a mile long can seem to overtake the joy of the season. Which is why there’s wine…Check out my latest entertaining guide, I hope it provides inspiration for a stress free gathering! This design is perfect for hosting an intimate Christmas dinner by the fire. I chose a moodier color scheme of evergreens, burgundies, and grays. Using christmas greens as a runner down the table is such an easy, low fuss centerpiece that has major impact. You can even trim some from your backyard. I added sprigs of fresh eucalyptus, ruscus and red huck as accents. I brought the burgundy colors in with gorgeous orchid buds and added privet berry branches. White or red roses are also an easy alternative to find that will do well out of water. Just be sure to add them closer to your guests arrival. I also made a matching garland for the fireplace mantel. I started with a simple garland I added to the mantel first, then built onto it from there with floral wire to create a more lush look. 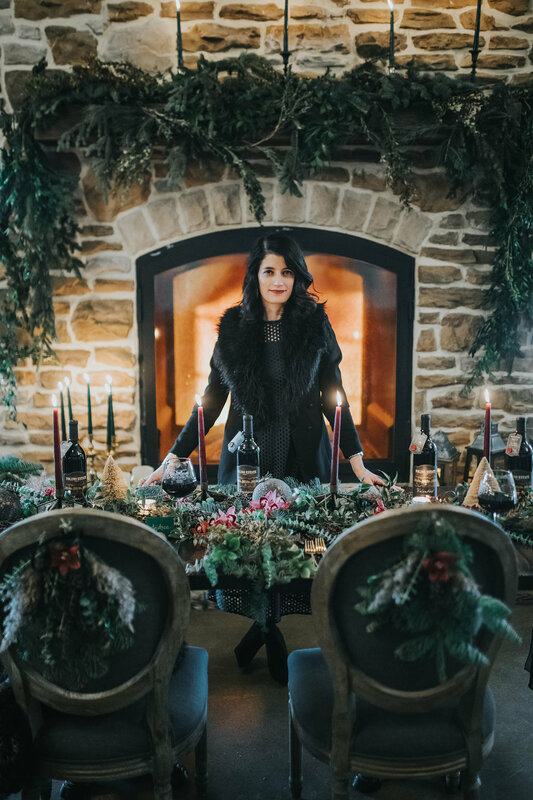 By the way, I’m hosting a Christmas Centerpiece Workshop on Sunday, December 16th if you’re interested in joining me! One of my favorite parts of the design are the little chair swags. They take seconds to make and are such a pretty accent to each guests’ place setting. Mixed in with the greenery on the table are some great accents that can be found in our gift shop as well! I love the blue-gray ornaments as well as the taupe bottle brush trees in various sizes. One of my favorite pieces right now are the antiqued mirror candlestick holders. The mirrors bounce off the light from the glowing candles in such a beautiful way. 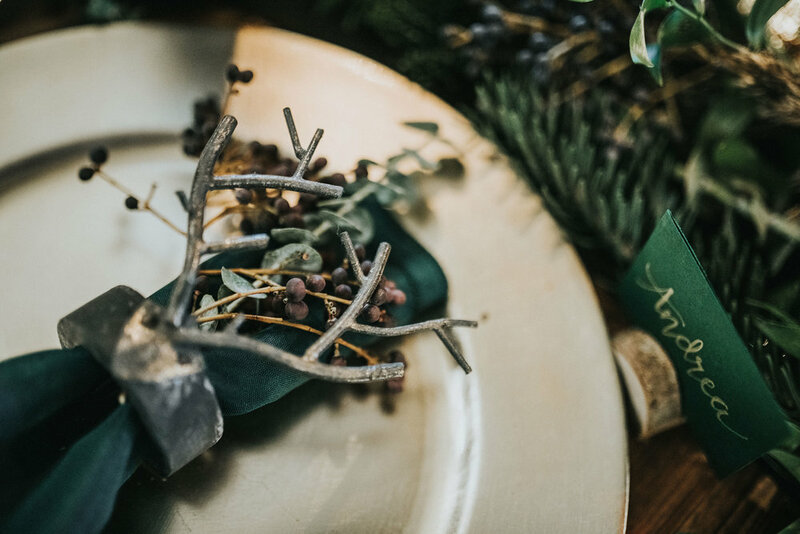 Each place setting features one of our antler napkin rings that are not only perfect for Christmas, but can be used for Thanksgiving or any other winter dinner you may be hosting. We also have the little wood stumps for place card holders that can even be used as food or drink markers. 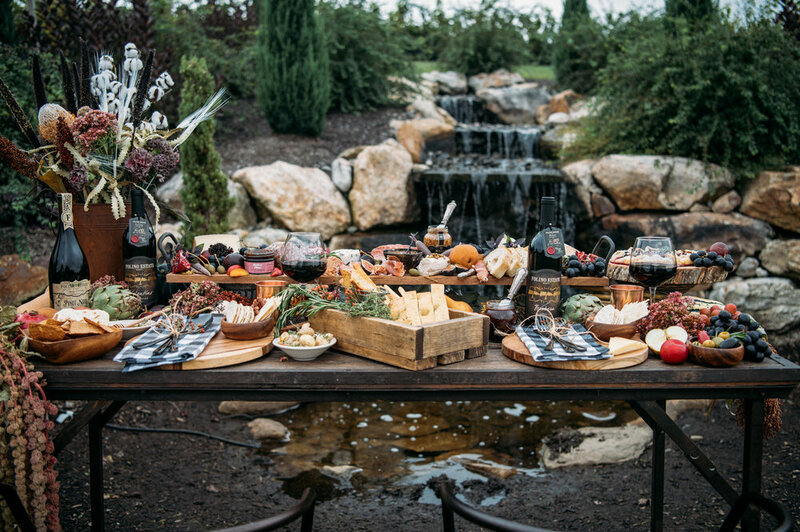 No entertaining guide of mine would be complete without an epic cheese board. It’s always my go to for when I have a party since it’s simple, everyone loves it, and they can be so beautiful and versatile. We have a large selection of boards in our gift shop, this particular one being one of my favorites. It comes in a round or rectangular shape and are very large for adding all the deliciousness that’s necessary for an amazing board. I added winter citruses and pomegranates, as well as some cranberries for color. My favorite addition is the little christmas tree shaped cheeses. They’re so easy to make, just choose a semi-soft cheese and use a small cookie cutter. There’s cranberry cheese, rosemary sprigs and candied nuts as well as cinnamon whipped honey and pear balsamic jam. For some sweets, there’s chocolate covered dried cranberries and yogurt covered cranberries. These boards are perfect to prep ahead of time and set out for your guests to enjoy while you’re putting the finishing touches on dinner. Don’t be surprised if it’s gone quickly though. While your guests enjoy the cheese board, they’ll obviously appreciate a nice glass of wine. 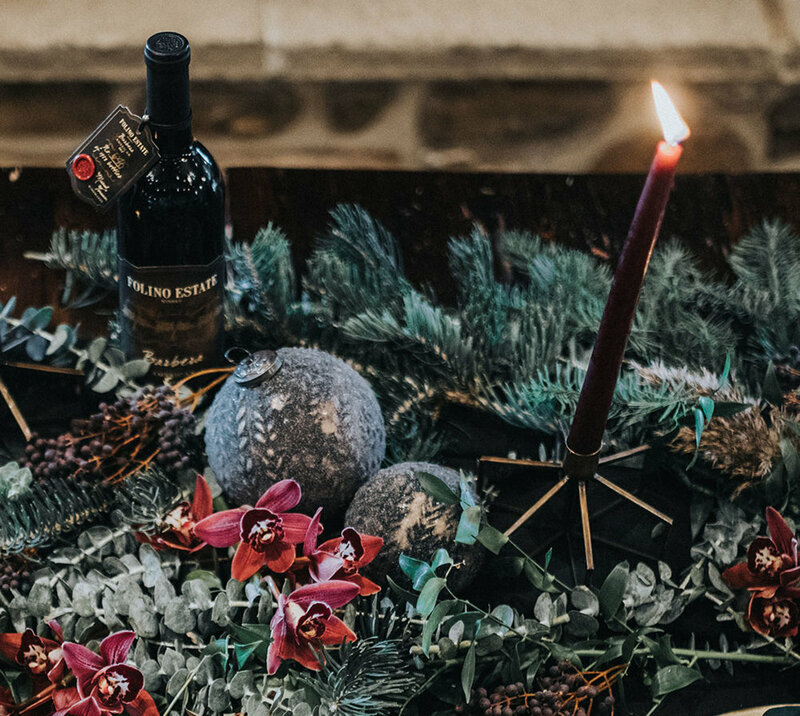 Our Black Label wines were made for dinners like Christmas. 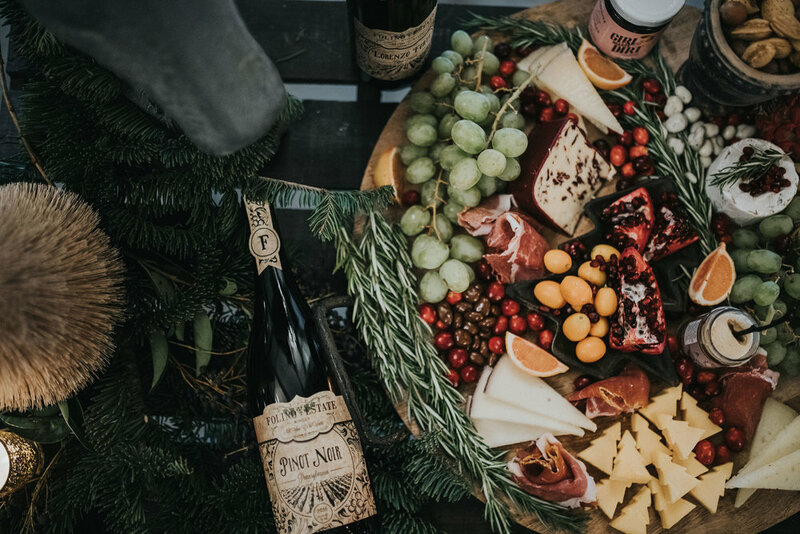 They’re ideal to pair with the meats commonly served during the holidays and will have your guests impressed you’re serving them wine made in Pennsylvania. Our classics like Merlot, Pinot Noir, and Lorenzo Forte are also great choices for serving with a roast or ham. I hope you enjoyed and I wish you all the happiest of holidays! Check out more images from our shoot done with the talented Prevailed Studios below. Fall is my absolute favorite time of year. The mornings and nights have that crisp chill in the air, the leaves start to put on a gorgeous show and mulled wine makes its long awaited appearance! The change of seasons are a perfect time to get a group together. 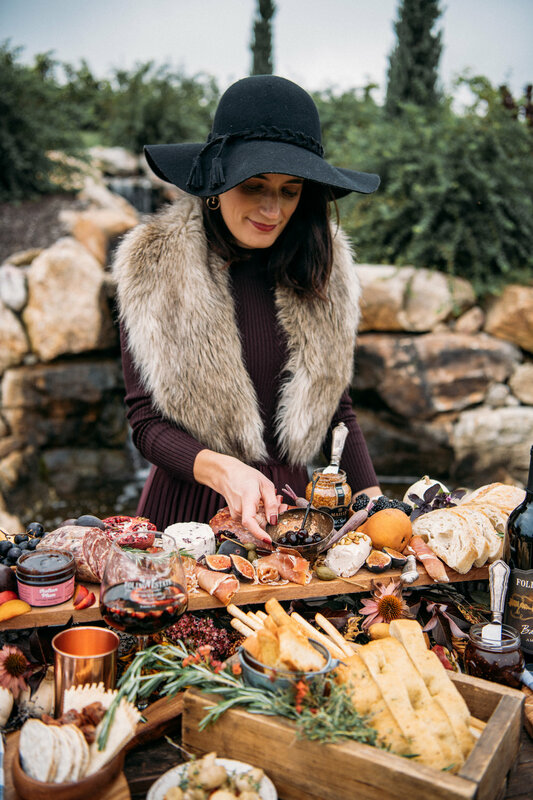 As most of you know, my go to entertaining dish is an amazing antipasti spread and the inspiration behind our Salumeria Bar at our new location Vintner’s Table, coming soon! Right now, grazing boards are a huge trend and are easy to put together, yet make a show stopping display. Read on to find out how to make one and what wines I recommend serving this season! 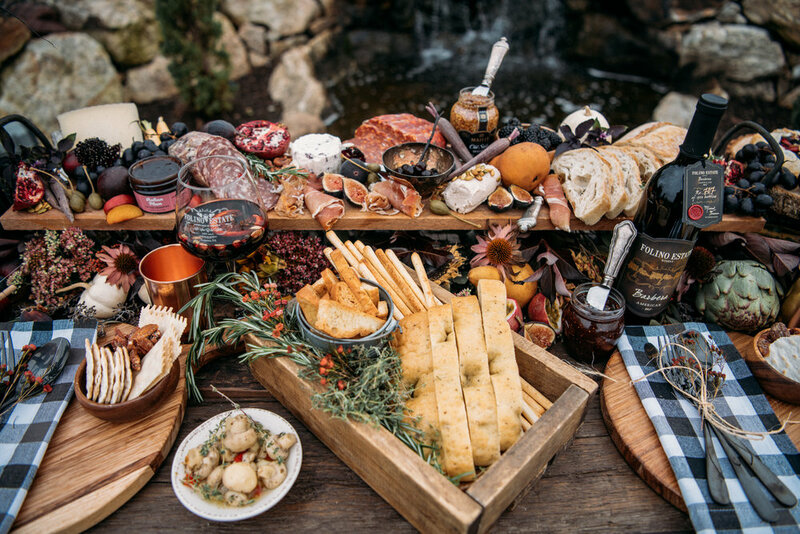 A feast not only for the stomach but also for the eyes, grazing boards are gaining popularity. What’s so great about them is you can also tailor it to whatever theme you’re looking to achieve, i.e. summer seafood inspired, Valentine’s Day, brunch etc. First choose your serving boards. A mixture of different kinds or one large one like we’ve used above (we have many options available in our gift shop!) are all good options. It can be wood, marble, granite, metal, slate, ceramic anything that is food safe and will show off the colors in the foods you’re using. A fun addition to my table, I used small wood paddle boards as plates for my setting so guests can assemble their own mini boards from the main grazing board. I also filled small wood bowls with crackers and nuts as a starter at each setting. Little bowls, spreaders, and tongs are needed to assemble your board as well. Serving vessels will also add height and visual appeal. If you’re going for a vegetarian or vegan theme, skip this step. You can either cut everything up or leave it whole, but I like to do a mixture of both. Always take your cheeses out of the refrigerator at least 1 hour and up to 2 hours before your guests arrive. Meat should be 15-20 minutes before. When choosing cheeses, it’s best to serve a mixture of hard, semi soft and soft. I included a cranberry fig goat cheese and pumpkin cheese as Fall was obviously the inspiration behind my board. Guests need something to spread the soft cheeses and jellies on, so you’ll want to provide some soft breads, crostinis, crackers, etc. Pickled and marinated foods act as palate cleansers between bites and can heighten the flavor of some foods. Olives, marinated mushrooms, caper berries, and pickled vegetables like the ones we sell in our Tasting Room from Tillen Farms are all great options. You can also add in-season raw vegetables and fruits and dried fruits. Spreads and condiments are the next thing you’ll want to add. We have an amazing selection in our Tasting Room from Stonewall Kitchen and a new company for us, Girl Eats Dirt. I loved the Italian Plum cutting preserves for my Fall board. We also have honey by Savannah Bee that’s made specifically for cheese. Salty and sweet nuts like the candied pecans and sunflower seeds I’ve included are also a necessity for a good grazing board. Next, you’ll want to make your board pretty. 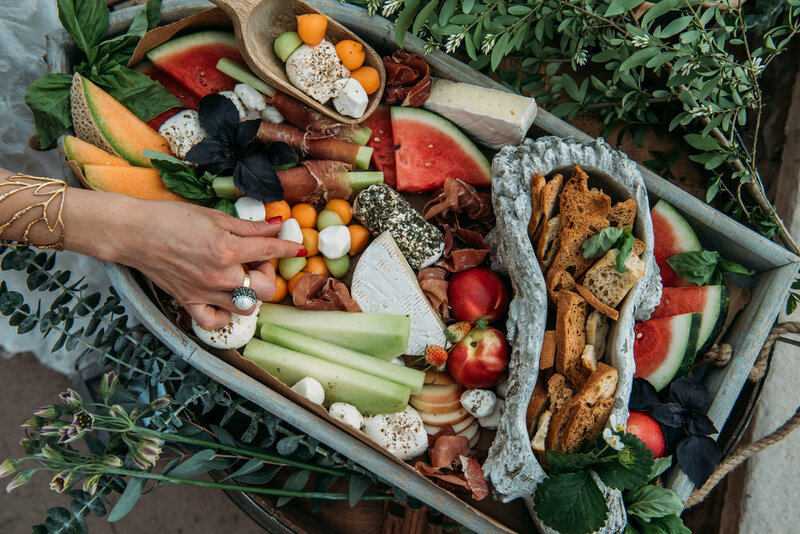 Fresh flowers, whole fruits and vegetables and fresh herbs are all perfect finish touches to finalize your grazing board. I love flowers and included lots of fall blooms, like dried sunflowers, coneflowers and sedum. I also added mini pumkins and gourds. My floral arrangement consists of fresh and dried flowers. Your guests will always appreciate something sweet and one of my favorite easy desserts to make is a fruit crostata, a dessert my mom taught me. You can get extra points for making your own crust, but I am a cheater and always just use pre-made pie dough. Don’t judge. I made a delicious Red Plum & Concord Grape Crostata that’s so good, no one will ever notice the crust isn’t homemade! What’s a grazing board without a great glass of wine? I’m so excited to have our Black Label Collection available for this Fall as the wines in this collection go so well with the bold flavors of Autumn. Our Pinot Noir is another one of my fall favorites. It’s a great transitional wine from summer whites and rosés (although I will drink rosé year round) and the essences of cranberry are ideal for the season. While the wines I mentioned above are all great options, our Mulled Wine has to be my top pick for Fall. The orange and cinnamon flavors mixed with cloves and other spices smells like Fall. While you can make it with a variety of red wines (or even white, stay tuned for our Christmas Entertaining post!) we like to use our Chambourcin. We also sell jars of the mulling spices we use to make our signature Mulled Wine so you can make it at home easily. 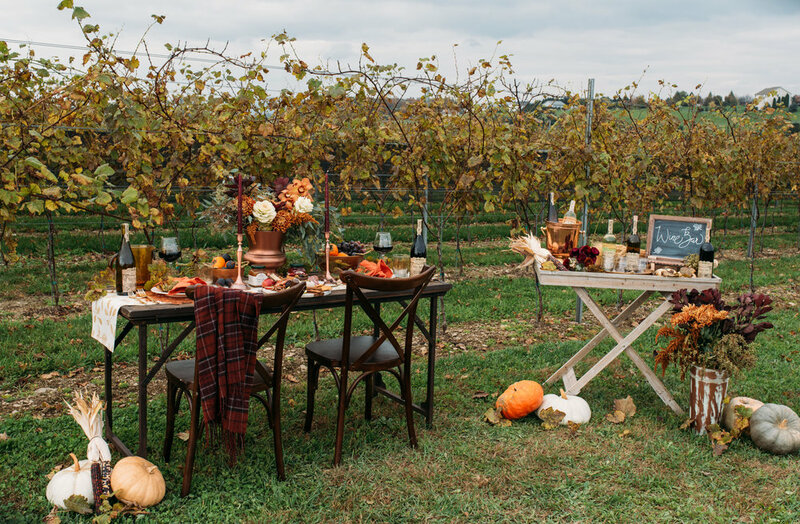 I hope you enjoyed my Fall Entertaining post and I look forward to seeing you at Folino Estate this season! We’re excited to be hosting our first Thanksgiving Feast this year! Check out more images from our shoot below. Finally! What has felt like the longest Winter ever is officially behind us and sunshine and warm days have arrived. 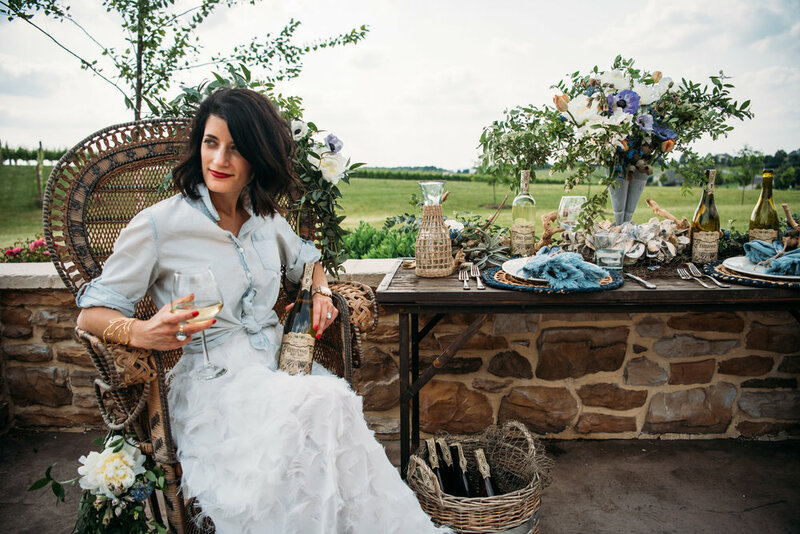 It's the perfect season to entertain on the patio and I've put together some inspiration for your next occasion and of course some of my top Folino Estate wine recommendations for Summer! 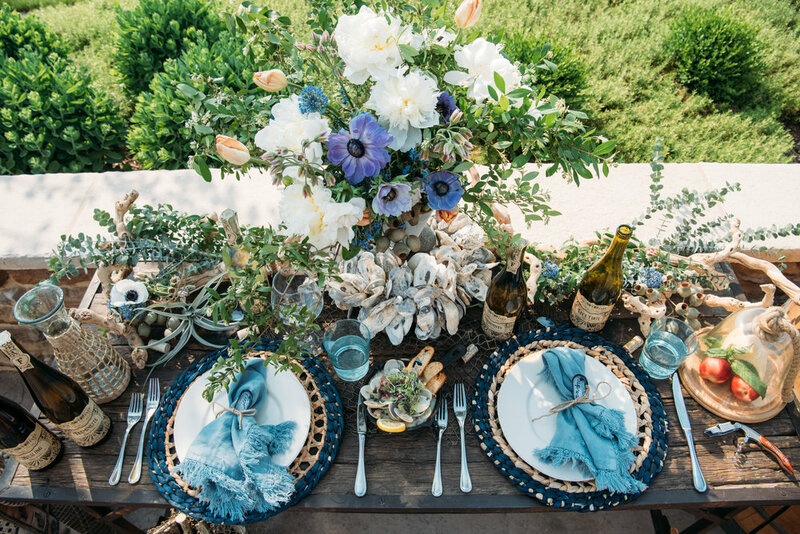 I like to start with a loose theme when I'm entertaining and for Summer, a beachy, nautical vibe is always a fun choice, even if the closest ocean is miles away. Transporting your guests adds an extra element to your party. For place cards, I washed mussel shells from a dinner I made the previous night. It's a whimsical touch your guests will love. I also tied the napkins with twine and used woven chargers. Blues are a great summer color to use, especially to bring in the vibe of the ocean. Craft stores sell fish netting and was the perfect detail to use in place of a traditional runner. Grape wood branches, an oyster shell wreath and a beautiful floral arrangement I made with blooms from local flower farmer, The Rustic Bunch all came together as the finishing touches. When it comes to food, Summer entertaining should be easy and simple. Warmer weather is usually met with lighter fare, which is why I put together a delicious melon and proscuitto inspired antipasti board. I used a wooden boat tray from our gift shop and added a variety of soft cheeses like mozzarella, burrata, goat cheese and brie. I love the flavor combination of salty and sweet. Proscuitto wrapped melon is a favorite of mine and this time of year, the fruit can't get any sweeter. Seafood is a must in Summer and I borrowed a dish on our Folino Estate menu that I personally love. Garlic Steamed Clams are easy to make and so full of flavor. Made in a white wine butter sauce with crispy pancetta, make sure to serve with crusty bread to soak up all the delicious sauce. The recipe is shared at the bottom of our post. And now for my favorite part, the wine! While certain red wines are completely acceptable to serve chilled in the summer, I chose our whites to go with the menu I selected. Luca Forte is an exceptional wine that works with so many dishes, thanks to its blend of a variety of different whites. It's best when slightly chilled and brought out to almost room temp. The Chardonnay Barrel Reserve is ideal for those who love a good oak aged wine. It stands up well to meatier fish, like Swordfish. It's also great with lobster and creamy pasta dishes. Pinot Grigio is a classic summer white and is so easy to pair with a variety of dishes. In a few weeks, we'll be releasing our estate Pinot Grigio and I know I may be biased, but our winemaker has outdone himself with it! I can't wait for it to hit shelves. If you're looking for the best white to serve with fruit or dessert, Riesling would be my pick. It's a sweeter white, but not too sweet that it competes with the sugars in dessert. 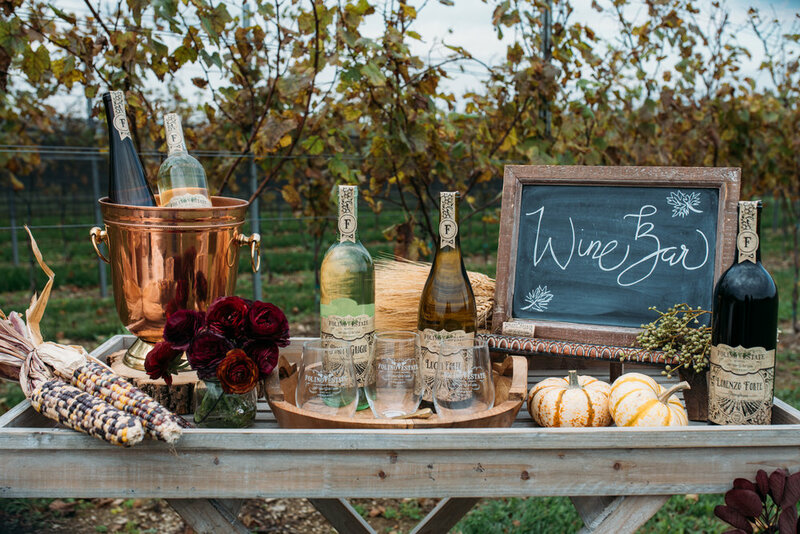 I hope you enjoyed my summer entertaining ideas with Folino Estate wines! We love to see you drinking your FE at home so don't forget to tag us in your posts! Happy Summer! In a saucepan over medium heat, add olive oil, garlic, and pancetta. Lightly brown garlic and pancetta, being careful not to burn the garlic. Add lemon juice and white wine. Add clams and cover until they open. Remove cover and any unopened clams and cook sauce until it reduces by half. Gradually add the butter to make a sauce. Place clams in a bowl and pour sauce over top. Add fresh parsley, salt, and pepper. Serve with crusty dipping bread. Hi everyone! 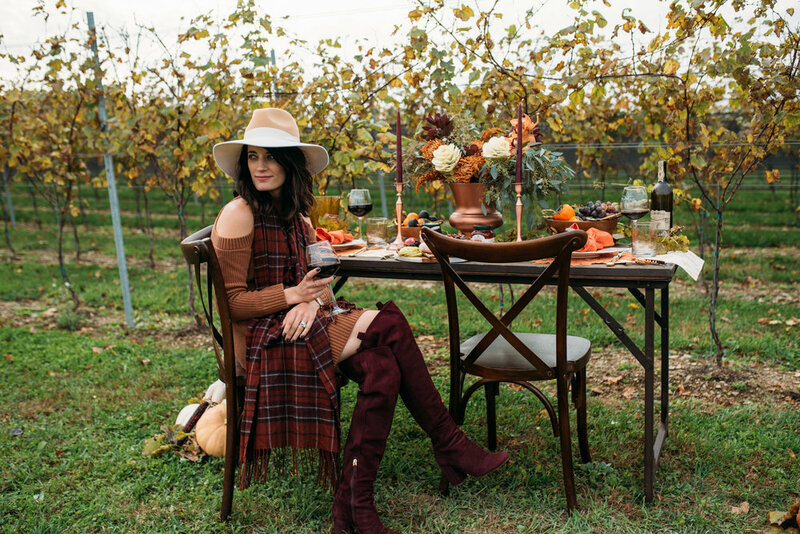 It's Andrea Folino and I'm so excited to share our beautiful styled Thanksgiving shoot in our vineyard! We'd love to be a part of your table this year with our great variety of wines. 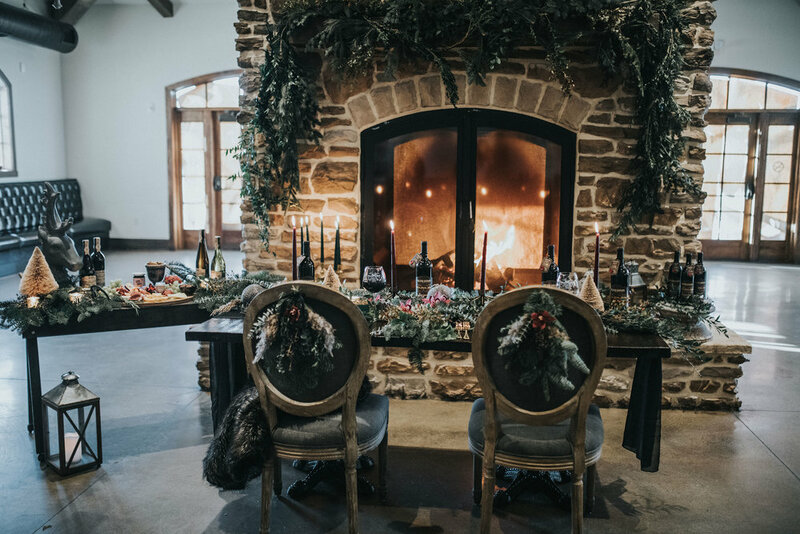 Read on to find out which of our wines will pair perfectly with your Thanksgiving dinner and some other great ideas for the holiday! A newcomer to the Folino Estate wine family, we're recommending Luca Forte as our 2017 Thanksgiving wine. A white burgundian blend of Chardonnay, Viognier, Marsanne & Roussanne it is our only full bodied white which means it can stand up to a variety of flavors your Thanksgiving dinner will feature. It also has a strong pear aroma, ideal for the Fall season! Our 2016 Pinot Noir is another great option for turkey and all the great sides that go with it. 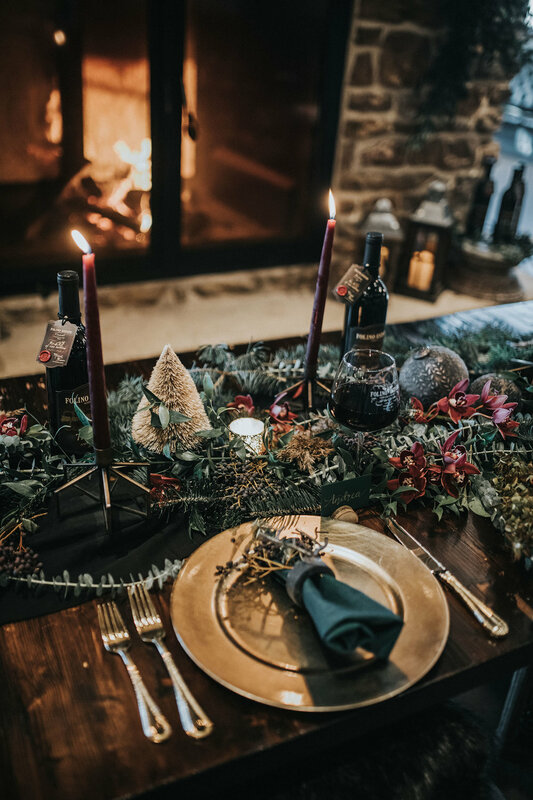 Pinot Noir is traditionally a strong recommendation for Thanksgiving, mainly because it's a lighter red with gentle tannins and a bright acidity for marrying well with the entire meal, including turkey, cranberry sauce, sweet potatoes and a variety of vegetables. Serving it slightly chilled will help bring out the fruity flavor profile as well. One of my favorite parts about hosting any dinner party is putting together an antipasti board. There are so many options of what to use, they pair so well with a variety of wines, it's easy to put together, and they look beautiful. Win win! I put together a Fall inspired board for the occasion, featuring a delicious pumpkin goat cheese, sunflower seeds, a variety of pumpkin seeds, pecans, fig & olive crostini, pumpkin crackers, and seasonal fruits like fresh apples, pear & figs. Seasonal jams & jellies are a great option to add to an antipasti board, as well. Stonewall Kitchen is available in our Tasting Room and our picks for Fall are the Bourbon Pear Onion Jam and Orange Cranberry Marmalade. Another easy, yet impressive idea for your guests is to put together a wine bar. 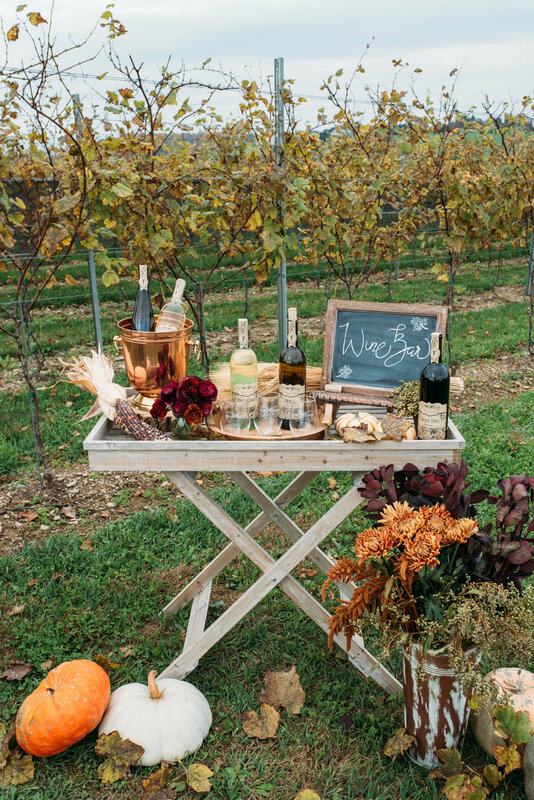 Open a variety of wines and set out for your guests to try any or all they'd like! You can even add tasting notes for everyone to jot down their thoughts and compare with one another after the meal. Stop in this weekend and speak with any of our wine educators in the Tasting Room who will be glad to recommend wines tailored to what you'll be serving. 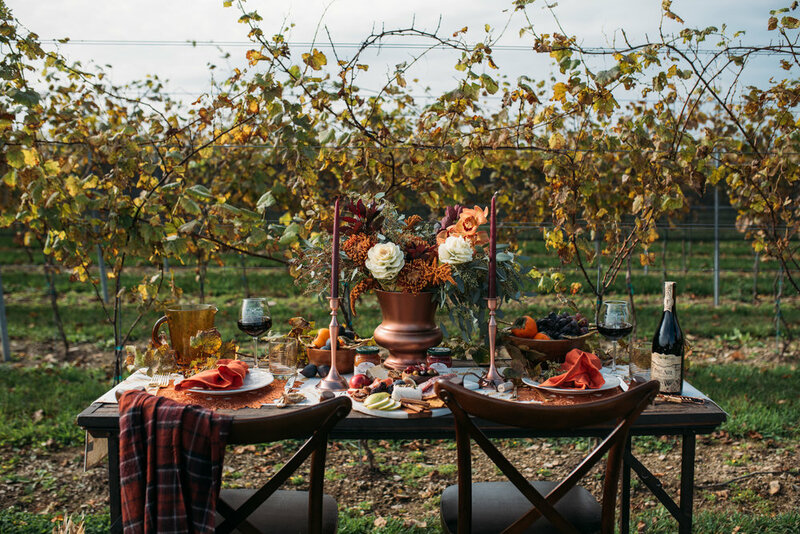 From all of us at Folino Estate, Happy Thanksgiving! Check out more images below from our shoot!